7 Feedbacks on "Larry Correia Estimates the American Insurgency"
I would just add that an attitude of “Oh, they’d never respond violently to our violence” is generally how wars break out. A fine rant! Not to bring up, like, History and stuff, but back when we threw the tea in the harbor and told the British to piss off, one could have asked how a bunch of guys hiding behind trees with muskets could ever expect to prevail against one of the preeminent military powers of the world. I mean, the Brits had ships, and cannons, and rows and rows and rows of well-equipped, well-trained soldiers. Those silly colonials didn’t stand a chance. While we are on the subject of numbers and guys with guns hiding behind trees, in Michigan alone there are roughly half a million deer hunters – guys whose hobby is shooting human-sized animals from concealment. I wouldn’t count on the deer hunters. A goodly number are Fudds who think nobody needs an AR-15. They might chnage their minds when the do-gov comes for their high powered sniper rifles. After all, nobody needs to go hunting. Of course nobody needs to go hunting! There’s fine food available at the grocery store. Not to mention BAMBI! How can you shoot BAMBI! I’m wondering how the Left reconciles this idea that citizens armed with rifles could not beat an army when that is how they claimed Viet Cong guerrillas beat America in Vietnam. I have a couple questions for Congressman Nukem. How are you going to convince an American military man to drop a nuke on his own country to enforce a political position? If you get past that, how are you going to separate the liberals from the conservatives far enough so that a nuke won’t frag your liberal friends? Given that nukes spread radioactive pollution to hell and back, how are you going to convince liberals that would be a good thing? Since dropping a nuke in the countryside, where most conservatives live, would be a waste of a nuke, you’d have to drop it on a city full of conservatives. That means you’d have to secretly tell all the liberals to leave and abandon their homes to nuclear destruction, so that you could nuke the right wing nuts. And on and on and on into ever greater absurdity. Imagine how Socialists in power will point to rulings by their judges explaining how the 2nd Amendment doesn’t apply any more. 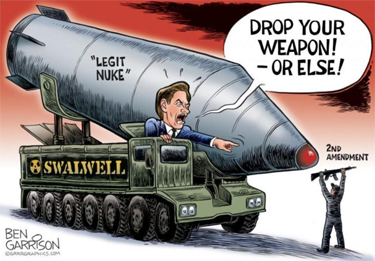 That’s so persuasive that Swalwell is dropping that farce and just going nuclear. Maybe the Founders weren’t too white, too old and too male to possess any wisdom on these matters after all. And, of course, there are gang members and other criminals who are not about to surrender their weapons.